Dentures are a wonderful tooth replacement option for patients that are missing all of their teeth and may not be candidates for dental implants. At Merion Village Dental, we take detailed steps to provide the best fitting dentures, custom fit to provide a reliable full mouth restoration. 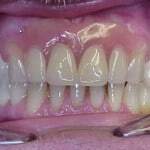 Complete denture placements don’t have to be a difficult process. We may select from an immediate denture or traditional denture to treat your particular situation. Immediate dentures are placed the same day that any teeth are extracted, and re-lined after full healing has been achieved. Traditional dentures are dentures that are delivered after healing has been achieved, or to re-place an old set of dentures. We create custom dentures to help you smile with confidence again! You shouldn’t have to suffer through meals or social events due to missing teeth. If you’ve had problems with problematic dentures or missing teeth, we invite you to visit Merion Village Dental and gain control over your smile! Our custom denture treatments will bring your smile back.